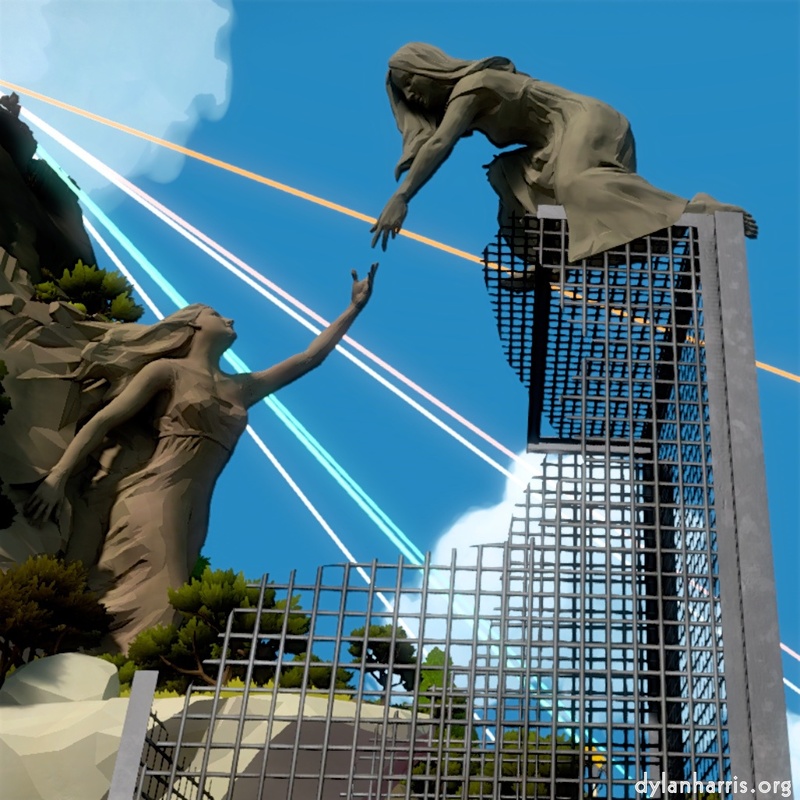 Thekla’s The Witness is a different style of puzzle game, quite beautiful, which gives the player full control to play and explore at their own pace (with a couple of small exceptions). As such, it is possible to enjoy the setting, and appreciate it for its own sake. Beyond the introduction, you don’t have to play a puzzle to appreciate most of what there is to see. This is ace. The game is set on an island with perfect weather. Imagine Sark had been sculpted by a mad landscape gardener, and you get the drift. The island has many small sections, each with its own theme. There’s a castle, a village, a desert, a mine, tree houses, a swamp, jungle, a research centre, a mountain, and more. The puzzles can be tough. They are simple in form, and some are very simple to solve, but others are right bastards. Although the fundamental form of every puzzle is the same, drawing lines through a maze, there are a rich set of subtypes. A particular subtype is often associated with a specific section. For example, in the desert, with its unforgiving sun, you use light to find the solution. In the jungle, with its calls of wild animals (well, recordings of wild animals), you use sound. Despite the great number of puzzles, all of the same fundamental form, there is no repetition, there is no boredom. Clearly, a great deal of care has gone into getting them right. The puzzle rules, though, can be a little too concealed for my taste. It’s fair enough for the game designers to prefer that players work out how the puzzles work, rather than telling them, but the simple tutorials can be insufficient, and, in some places, ambiguous. For example, there’s one type of puzzle where you must isolate different components into different sections, but what I understood from the tutorial was that I had to fence the components apart. I had to cheat when later puzzles refused to accept what should have been correct solutions, by looking on the net to find out what the tutorial had misdirected. You do not need to solve all the sections to finish the game; indeed, doing so would be very difficult. I got to the end, but there are some sections I did not visit. As such, this is a game that is certainly worth multiple runs. I will probably come back myself, but not until my desire for puzzle games has recharged itself. Right now, I want to frag some baddies, and that’s something you cannot do in The Witness. There is a second layer of puzzles, environmental puzzles, which, so far as I can see, only exist for completionists. 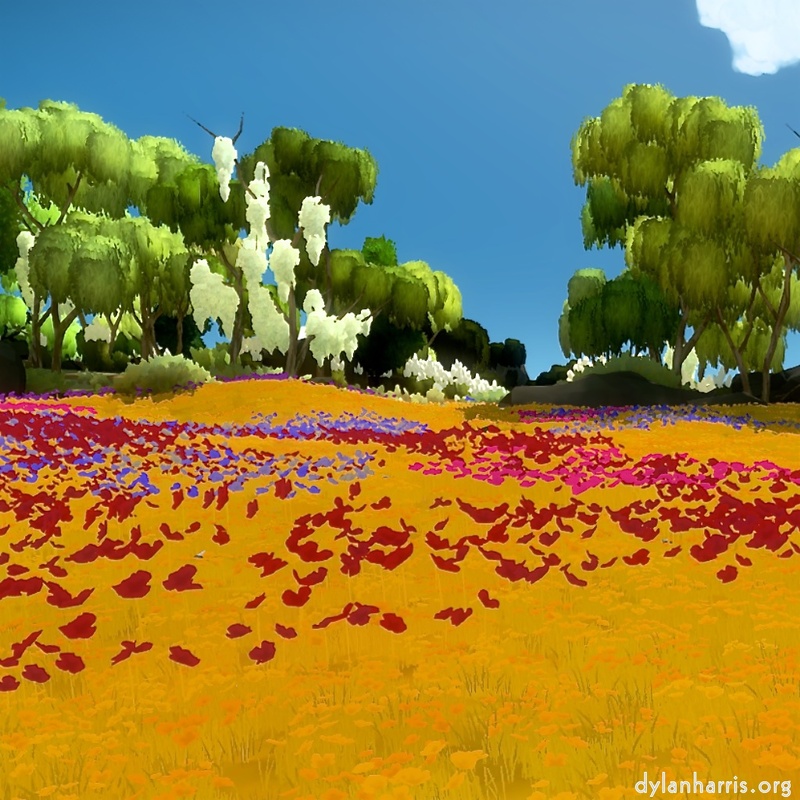 The player looks around The Witness world: at walls, in reflections (yum), at the sky, in the landscape, at the coincidence of disconnected components where s/he happens to be standing. The player is seeking to see a circle, a semicircle, and a line between them, all in the same broad colour. If they’re there, trace the line from the circle. If they can be made, make them. If it’s an environment puzzle, fireworks fire work, and success is recorded on a black control column. Ok, I’ll admit it. I have a bit of a problem with puzzle games. I bought a slew of entertainment software over Christmas in the sales, pretty much at random, and seem to have bought mostly these games. This was probably a mistake. I play games, when I do, to relax from my working day, so I do not want to do in the game what I do in my work. My day involves solving glorified puzzles—well, technical problems, but the process is similar. I prefer to exercise unused parts of my mind, to excite that dulled by the daily grind. Like George Szirtes, I want to feel, not fathom. I want poetry, not puzzles. Still, this is my problem, and not the fault of the game; but now you know why I prefer the setting to the solving. This is a game to play for its visual beauty, for its ‘feels right’ environment. The colours are mostly simple and saturated. That’s not overdone, it just makes everything unreal—but given that’s exactly what they are, so be it. The details, such as those in the trees, are more symbolic than right, but you still know the trees are trees—well, maybe statues of trees. Ultimately, the point is the game’s display engine may produce beautiful results, but it is rather dated. It clearly offers other advantages, since it was made for the game. For example, there are no cut scenes to interrupt your play (except for the ending), nor are their other breaks and barriers that block the flow of the experience. The game is very smooth and free–playing. That’s good. It’s not perfect, though. There are one or two places where I worry the imagery may be too intense for those who can be made ill by visual effects. There are a number of types of puzzles that I have not covered. 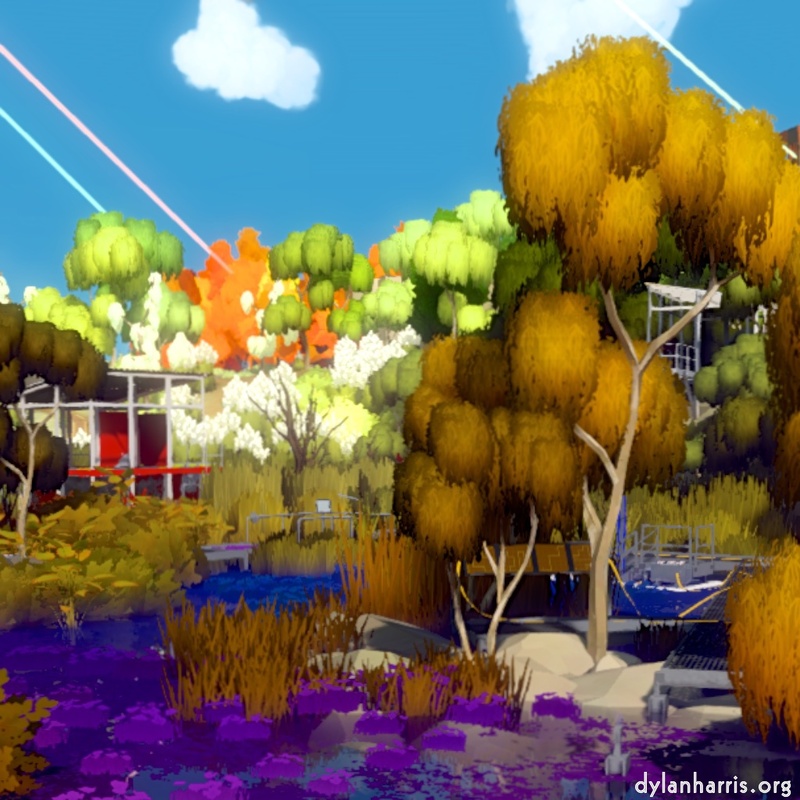 The first are the environmental puzzles, those set in the landscape itself. You draw lines on footpaths, you drawn lines on the sky, you draw lines on shadows, and things happen. I have not worked this out. Then there is the big puzzle that is the game itself. There are a lot of hints and directions that something has happened, or at least implying something about the ethos of the game. Consider the name itself, “The Witness”. Is the Witness the player? If so, what is being witnessed? Himself/herself failing to solve the puzzles? If so, so what?! Then there are the dozens of statues, often in significant poses, which seem to make some sense in a particular context. I’ve not sussed the relationship between who they represent, what they are, their poses, their locations, and the overall game. What about the themes of the various sections? I would be surprised if they were chosen for no game reason. I think there’s a grand puzzle here to understand, and that’s another reason for a revisit. I do hope it’s an arts puzzle, a comment on the human condition, and not just some bigger, more complicated, series of lines of light. The sound? It’s ambient environment sounds. With a couple of exceptions, where sound is part of the puzzles, this is a missed opportunity. Music could and should have been used as part of the play experience, at the very least to help direct players to solutions (as done effectively in The Talos Principle). The sound has little colour, little emotion, no humanity. It is not language. It is a mistake. Overall, this game is definitely worth purchasing from a discount bin, but I wouldn’t pay full price. I’m happy with my sale purchase.